This decision led to an evaluation of ESD protective flooring. In 1998, 20,000 square feet of conductive floor tile were installed in the main production area. To help brighten the area, white tile was selected. The floor resistance measured less than 1.0 × 106 W.
At this same time, we wanted to evaluate and improve the ESD program. Kimco, our ESD control supplier, recommended that Desco provide an ESD survey, which it does at no charge. 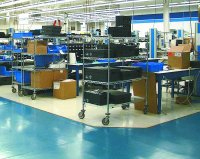 Desco suggested a high-end dissipative floor finish, assuring us that a specific ESD floor finish would improve the gloss, reduce costs, and not damage the electrical properties of the floor. We were very skeptical, especially since the tile manufacturer had always told us that conductive tile should not be waxed. We contacted Desco, which responded immediately by sending a regional sales manager to see the floor and a product manager to review the process with the maintenance company. The cause: the mops. While dedicated mops were used, they were brand new cotton mops and not properly rinsed prior to being used, a common problem.